Thank you very much for your donations. I have ordered a new batch of ads. The tie in Colorado has been broken. Kerry is now ahead there (by 1%) for the first time, but it doesn't mean anything since it is well within the MoE. Still Colorado appears to be in play. 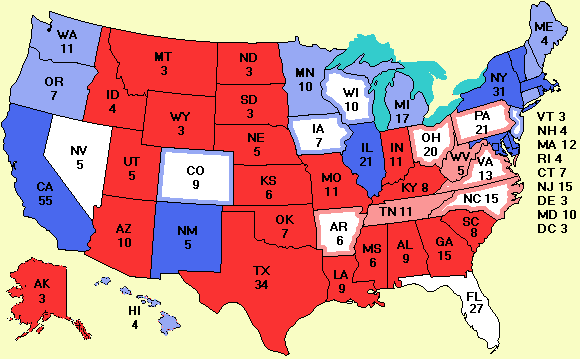 It would be ironic if Kerry won Colorado and only got 5 votes in the electoral college due to the referendum the Democrats pushed. If you haven't followed the referendum story, type: referendum in the Google search box at the bottom of the page. This box can be used to search all pages on the site. A new Survey USA poll ending Sept. 8 in Ohio, shows the race tightening there. Bush's 9% lead is now down to 3% there. He is now leading 50% to 47%. Bush's lead is also dropping in North Carolina (now 4%) and Virginia (now only 3%). Maybe the South will rise again (for Kerry, this time). At the very least, if Bush has to fight for some of the southern states, that will divert time and money from the Midwest. One piece of good news for Bush comes from an unlikely state: New Jersey. Kerry's lead in New Jersey is falling precipitously. It is down to 4% now, 43% to 39%, with Nader at 5%. Of course, it remains to be seen whether Nader will really get 5% there, or anywhere. Important Senate news today. Several new polls there have changed the outlook. Just going by the spreadsheet (i.e., the current poll numbers), the Senate will be split 50-50 as a result of a new poll in Oklahoma that now puts Brad Carson ahead of Tom Coburn (the former obstretrician who has admitted to performing abortions but now says abortionists should be executed). In addition, the spreadsheet says the Republicans will win the Louisiana seat, but since no Republican has ever been elected to the Senate by the people of Louisiana since direct elections of senators began in 1914, my best guess at this point is that the Democrats will actually have a majority in the Senate (counting Jeffords as a Democrat). This scenario was unthinkable 6 months ago. If you want to know how to analyze a poll, this report from the National Council on Public Polls gives some advice. A new feature has been added today. On the map giving the projected electoral votes (determined by extrapolating the state regression lines to Nov. 2), a button has been added. Pressing the button switches back to today's map. Releasing it goes back to the projection. In this way you can compare the two easily. I wouldn't take the projected map too seriously until October.